It is about letting the innate energy of Market Street reveal itself. If you look at the rich history of the street, it has always performed a really important cultural and creative role in our community. Let There Be is a new work of public art in the swiftly changing Mid-Market area. Let There Be is a mixed-media installation by Ben Davis that combines hand-crafted typography and projected content to celebrate the area’s energy, history, vast creative community and civic reemergence. It is located below the roofline on the eastern wall of 1019 Market Street, a newly renovated, historic building designed by architect George Adrian Applegarth and built in 1909. The building was originally the home of the Eastern Outfitting Company. Today, it is the newest addition to Zendesk’s Mid-Market campus and will serve as the company’s headquarters. 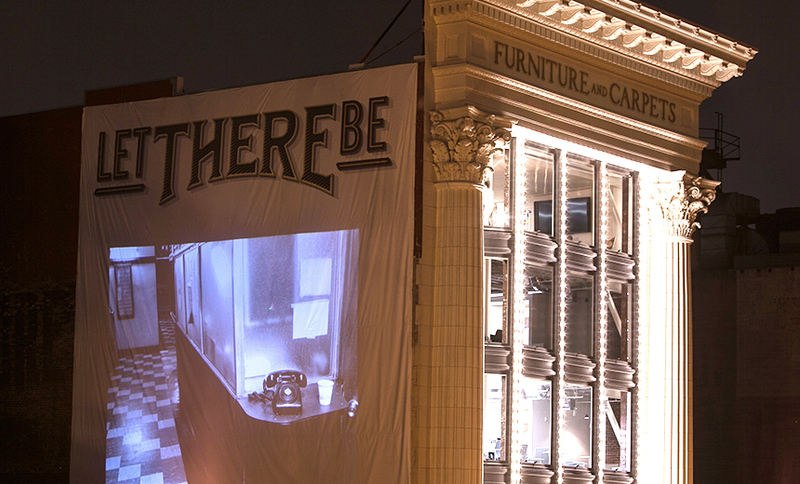 Let There Be is anchored by a 45’x45’ printed banner that reads, “LET THERE BE.” Elegant typography designed by Invisible Spark harkens an earlier era of vitality on Market Street. Every night at sunset, the word “Light” is projected beneath the initial phrase, then replaced by a stream of images and video that reflect Market Street’s history and diverse creative community. Submitted and collectively curated by community arts organizations, the projected content depicts the work of artists in a range of media and disciplines. Let There Be made its debut on June 26, 2014. The presentation started each evening just after sunset and repeated until midnight. The projection is currently stalled, but may be extended into 2016 with community interest and support. Illuminate the Arts welcomes all Bay Area art organizations to join in the ongoing creation of Let There Be. Organizations currently involved in submitting and curating content include: SF Camerawork, The Luggage Store, Free Space, Grey Area Art Foundation, the Museum of the African Diaspora, Yerba Buena Center for the Arts, A.C.T. and Lines. Illuminate the Arts would like to thank the following for their generous contributions to Let There Be.